SICK OF POLITICS? Maybe the Lord can bring us together in this hilarious new play starring Ed Asner as a wise and wisecracking God. Conservatives vs liberals. Red vs blue. Sometimes it seems like we’ll never find common ground! Whatever your political beliefs, you’ll find lots to laugh about in this new comedy. God Help Us stars TV veteran extraordinaire Ed Asner as a wise and wisecracking God. Talk about typecasting! 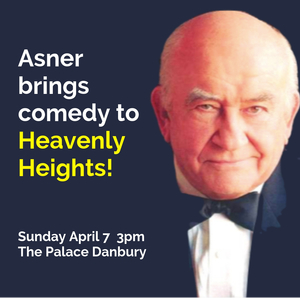 Asner is a seven-time Emmy award-winner known for roles like Lou Grant in The Mary Tyler Moore Show and its spinoff Lou Grant, Santa Claus in Elf , and the voice of Carl in the animated feature film, Up. Equally adept at comedy as he is at drama, he is one of the most outstanding and most respected actors of his generation. Asner will be joined onstage by Connecticut actors Karen Robinson and Anthony DePoto portraying the characters Randi and Larry. Randi presents the conservative viewpoint, while Larry leans liberal. To further complicate matters in this Crossfire misfire, Randi and Larry are ex-lovers. God Help Us is written by Samuel Warren Joseph and Phil Proctor, produced by Liza Asner, and directed by Mitch Levine. This performance will be the Connecticut premiere. One performance only. Sunday, April 7, 2019 at 3 PM at The Palace Danbury. Reserved Seating. All tickets $50. Tickets may be purchased in advance by phone at 203-794-9944, online at www.thepalacedanbury.com, and at the box office starting one hour before showtime.